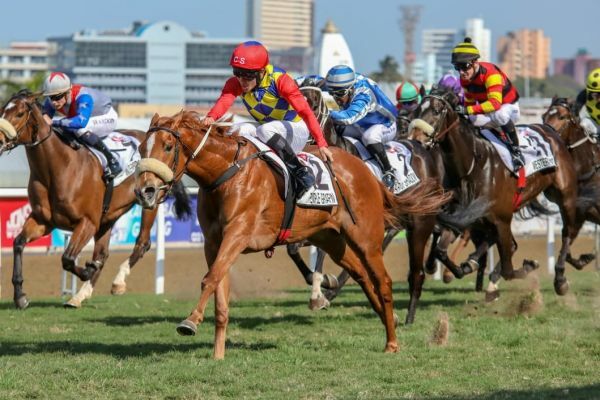 Cartier Champion and five time G1 winner Duke Of Marmalade has made a considerable splash with his first crop of South African runners this season, and this crop was represented by its’ first graded winner when Duke Of Marmalade 2yo filly Temple Grafin won the G3 Gagasi FM Debutante Stakes over 1200m at Greyville on Saturday. The Glen Kotzen trained juvenile was steered to a facile 1.75 length win by jockey Richard Fourie over the previously unbeaten Arianos Shadow, with G3 Strelitzia Stakes winner Inverroche two and a half lengths away back in third. Now a winner of two of her three outings, the Fran Cowe bred filly was a R300 000 buy from the 2017 Cape Premier Yearling Sale. In the process Temple Grafin, who was produced by the winning Greys Inn mare Inner Temple, became the 36th stakes winner for her sire, who has enjoyed notable big race success the world over. Duke Of Marmalade, whose first South African crop winners now number six, has more than 60 stakes horses to his name, with his tally of big race winners including Big Orange (G1 Gold Cup), Simple Verse (G1 Ladbrokes St Leger, G1 Qipco British Champions Fillies & Mares Stakes), Sound Of Freedom (G1 Premio Lydia Tesio), Star Of Seville (G1 French Oaks), and Nutan (G1 Deutsches Derby). He is also responsible for 2018 G1 Melbourne Cup hope Marmelo (winner of the recent G2 Prix Maurice de Nieuil) and 2018 G2 Oaks D’Italia runner up Flower Party. A Danehill half-brother to Investec Derby winning sire Ruler Of The World, Duke Of Marmalade, who shares his sire with the likes of Dansili, Redoute’s Choice, Exceed And Excel, Danehill Dancer and Fastnet Rock, has been responsible for group/ graded winners in all of Britain, Ireland, France, USA, Italy, Germany, South Africa, Canada, and Australia. Duke Of Marmalade, whose high class sprinting son Moofeed is now also standing at stud, has 12 lots on offer at the 2018 National Two Year Old Sale, including a half-brother to Irridescence Stakes winner Rose In Bloom (Lot 6), a colt out of G3 Yellowwood Hcp winner Enchanted Kingdom (Lot 237), a half-brother to smart performers Eddie Sweat and Billy Silver (Lot 243) and a filly out of Cape Fillies Guineas third Joshua’s Mistress (Lot324).